Based on the New York City School Library System, Empire State Information Fluency Continuum. Licensed under Creative Commons. An independent learner asks authentic questions and accesses, evaluates, and uses information effectively to develop new understandings. An independent learner responds to and creates literary and artistic expressions, uses effective strategies for personal exploration of ideas, and reads on his or her own by choice. An independent learner contributes to the learning community by seeking multiple perspectives, sharing his or her understandings with others, and using information and resources ethically. Source: Empire State Information Fluency Continuum: Benchmark Skills for Grades K-12 Assessments/Common Core Alignment. Developed by the New York City School Library System. NYC Department of Education. 2013. Noncommerical Use Licensed under Creative Commons. "Students need to use the skills of inquiry to learn. 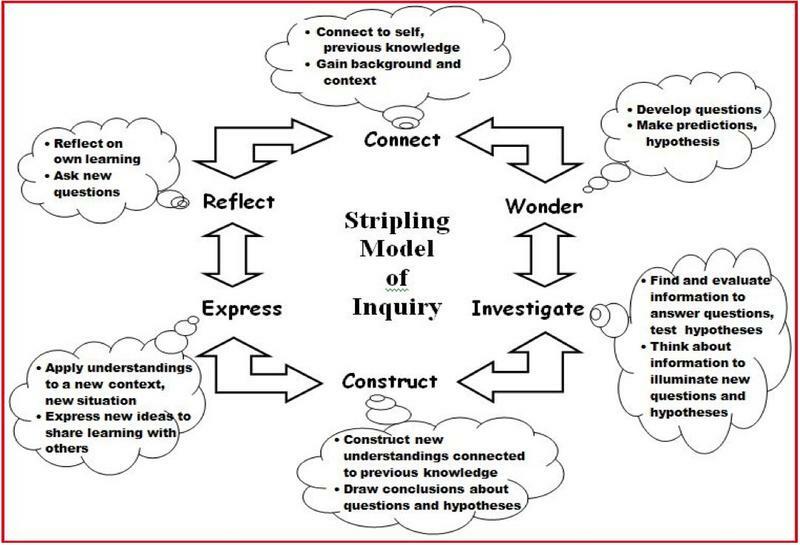 The Cycle of Inquiry and Learning provides a framework for active learning and the formation of new understandings." From "Introduction: Information Fluency Continuum, Benchmark Skills, Assessments." Empire State Information Fluency Continuum. Developed by the New York City School Library System.